The Raja Cycle and Motor Garage. Homepage. This page: A vintage receipt from a motor-car garage in India, dated September 1928. Raja Cycle & Motor Carage. 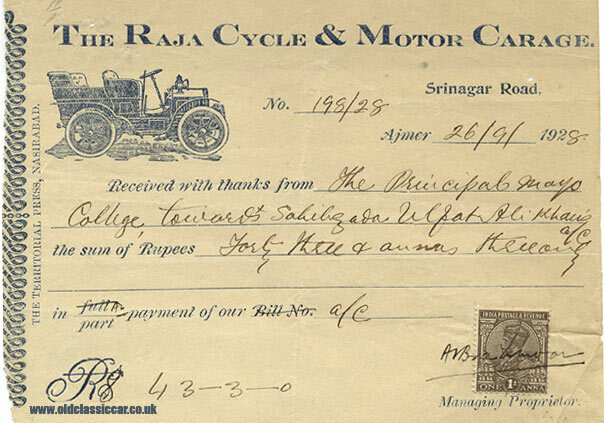 This interesting little snippet was purchased from India, and is a receipt issued by "The Raja Cycle & Motor Carage" - or should that really read "Garage"?, of Srinagar Road. A sum of 43-3-0 Rupees had been paid by The Principal of Mays College, and features a one Anna stamp. The receipt, printed on super-thin paper, was produced by The Territorial Press, Nasirabad. There is an illustration of what looks to be a veteran, or early vintage, four seater motor-car. A long shot admittedly, but does anyone have more information on this Cycle & Motor Garage?